PhotoScape is a program to edit and enhance images that stands out for how easy it is to use. It can be used to fix and improve digital images. We can use it to correct flaws in any picture, whether downloaded from the Internet or taken with a digital camera or smartphone. It comes along with a main user interface that’s really easy to use with the access to its main functions arranged in a circle. On the upper part, it also includes a tab-based navigation system that allows us to access any of the program’s options without going back to the main menu. Viewer: it allows use to view photos in their folder, even if they’re on an external device, and create a presentation. Editor: here we can adjust and fix aspects such as the size, brightness, red eyes and color, white balance, and backlight. We can also insert frames, balloons, text, filters, and drawings. We can also crop and clone areas. Batch editor: apply all the previous action to a group of pictures at the same time. Combine: combine several photos on the same page to create a single final picture. GIFs: it comes along with a tool to create GIF animations based on sequences of photos. Print: allows us to configure the printing of images in different formats (portraits, ID card photos, business cards…). Splitter: functions to split a photo into several fragments. Screen capture: allows us to take screenshots of the full screen or selected areas. Rename: lets us rename a photo or a batch of pictures. Converter: allows the conversion of a photo from RAW format to JPG. Face search: a function to search for similar faces on the Internet. As you can see, it comes along with other functions that aren’t strictly photo editing features but that are related to working with images, such as functions to view and create presentations or those that allow us to adjust different printing parameters. 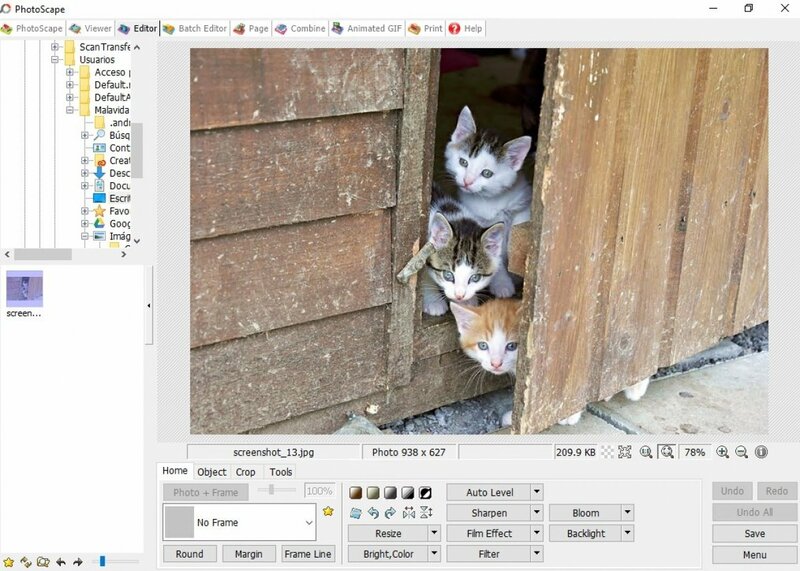 This program can be very useful for those users looking for a versatile image editor that’s not too complicated to use: it allows us to correct any flaw in an image, such as its color or the red eyes of a portrait, as well as applying filters and effects.